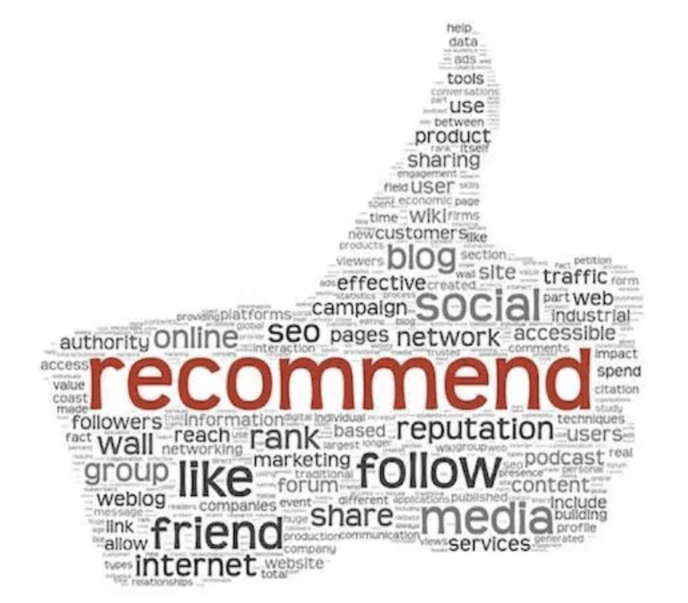 The Right Way to Build A Recommender System For A Startup? The original article is published here. A recommender system is the kind of service that every B2C startup needs. It can improve sales and user experience, while at the same time helping you understand your customers better. However, if you are setting up a new business, it is difficult and challenging to understand how to best set up a new recommender system. First of all, you need the right data strategy. Secondly, you need to understand what the key performance metrics for your recommender are. Are you trying to improve purchases, impressions or some other metric (e.g. conversion rate)? Finally, you need to establish the right machine learning strategy for the recommender system, since the types of models you’ll need are different depending on your user base, the volume of data you have and how mature is your company. So, let’s tackle each point in turn. I have talked about this briefly in another post , but there are a few points worth iterating. First, something very important to understand is that without the right data, the whole recommender thing goes out of the window. There is a saying in data science: garbage in – garbage out. Think carefully about what kinds of variables will influence your user’s decision to buy or not, and try to collect as many of them as you can. Is the gender relevant? The age? Location? Maybe you even want to provide your users with a questionnaire, so that you can collect more information about their preferences. What it is that you are trying to achieve? If you have an e-commerce site, you care about people buying products. If you have a job board, you care about matching people with jobs. If you have a dating website, you care about people interacting with each other. In every case, the key performance indicators are different, and you need to think about them very carefully. So, in an ideal world, you have a large user base and lots of clean and detailed data about your users. In the real world, things do not always work out this way. When you create a new business, you will face the cold start problem. This is when you have no data to start with, so you need to work based on intuition and build up from there. The first recommender to build is always a content based filtering system. A content-based filtering system simply assumes that the products and the users can be described as a set of attributes/features in a vector. The user’s feature vector is determined by purchasing behaviour, viewing behaviour (e.g. what is the user clicking on) and maybe a survey. Its job is simply calculating the similarity between a user and a product. This is a very crude recommender system, but it can perform well if you design it carefully. Plus, with no data, usually, you don’t have much choice. Once you accumulate more data you can move on to collaborative filtering or a supervised learning system. You can also combine all approaches to create a hybrid recommender system. Collaborative filtering usually requires lots of data points in order to work well, whereas with supervised learning you might be able to create something that is working well in the meantime. An algorithm that had great success recently in recommender systems is factorisation machines. Factorisation machines are able to take into account interactions between input variables, the same way as linear regression while being able to work with spare data and in linear time and state-of-the art results. Think about how the user makes a decision: Get some intuition into the features that are the most important. If you are a job board, then the salary is important. If you are a retailer, think about all the different variables that can influence the purchase of a product. Come up with the key performance metrics: What do you care about? Increasing sales? People clicking on news stories? Or people also spending a considerable amount of time on a news story after having clicked on it? Set up the right data strategy: Make sure you collect enough data to measure accurately the key performance metrics. Also, make sure you are collecting enough data from your users, which can be used to make accurate recommendations. Set up a content-based filtering system: This can help you beat the cold start problem. You can start running recommendations without data. Then move on to a supervised learning model: A supervised learning model (e.g. a factorization machine) will provide better performance, once you have collected enough data. 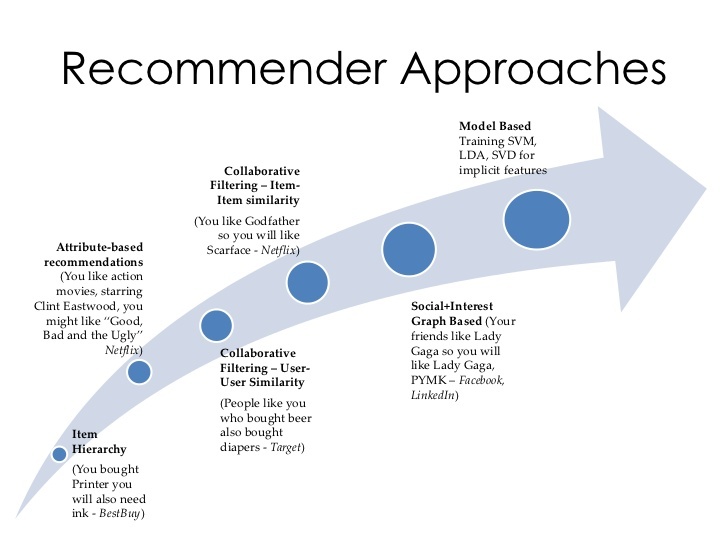 Move towards collaborative filtering or a hybrid recommender: As your user base and approaches the 1000s, then you have enough data to use a combination of approaches. Hybrid recommender systems are the best choice in terms of performance, as long as you have enough data. What Can Predictive Analysis Help Your Company? Predictive analytics involves advanced statistical, modeling, data mining and one or more machine learning techniques to dig into data and allows analysts to make predictions. Predictive analytics is used to forecast what will happen in future. For any kind of business, the ability to generate predictive analytic which enables businesses to identify potential events and opportunities, and either avoid or capitalize on them, as the case may be. In order to identify the indicators of events and opportunities, the use of data to make predictions that benefit the business. The real value of predictive analysis can best be illustrated by describing the major use cases that exist in business today, below are the main 7 use cases and applications. According to Neil Patel’s article on their website, the most famous SEO and online traffic expert. Predict churn can help massively for subscription model business. Measuring customer lifetime value is highly used on retailer and media industries. Predict customer lifetime value can facilitates marketing decisions and budget. Propensity modeling tracks customers buying habits as well as other actions such as opening a marketing email, signing up to a loyalty program, or participating in feedback surveys. The model correlates customer characteristics with anticipated behaviors or propensities. Sentiment analysis is the process of determining the emotional tone behind a series of words, used to gain an understanding of the attitudes, opinions and emotions expressed within an online mention. Sentiment analysis allow retailers and brands alike to understand the opinions of consumer feedback and User Generated Content. Is it negative or positive? What is the context of their opinion? Are they talking about the product or just a feature within the product? As a result, more and more companies are using sentiment analysis to make sense of the huge amount of consumer feedback that is coming their way and it helps to drive conversion. Shop.com, for example, is using sophisticated sentiment analysis and Artificial Intelligence technologies to analyze online opinions about the products they sell. Moreover, those opinions are then displayed on product pages and across the site and are turned into actionable insights and recommendations. Now shoppers can find the answers according to their own specific needs. Those use cases mentioned above are widely needed in the current businesses. If your company has not started to have a plan to implement predictive analysis, the company will suffer extremely lose of money. With predictive analytics, your company can have a proactive approach to the increase the revenue and reduce the costs. Predictive analysis can help you to plan for the future, and identify new areas of business. How To Build Recommender System With Machine Learning And Deep Learning? Building Recommender Systems using different approaches : Deep Learning and Machine Learning? The most requested application in machine learning and deep learning in Berlin? There are numerous e-commerce companies are based in Berlin, there are numerous job opening to hire data scientists to build a recommender system for their platform? 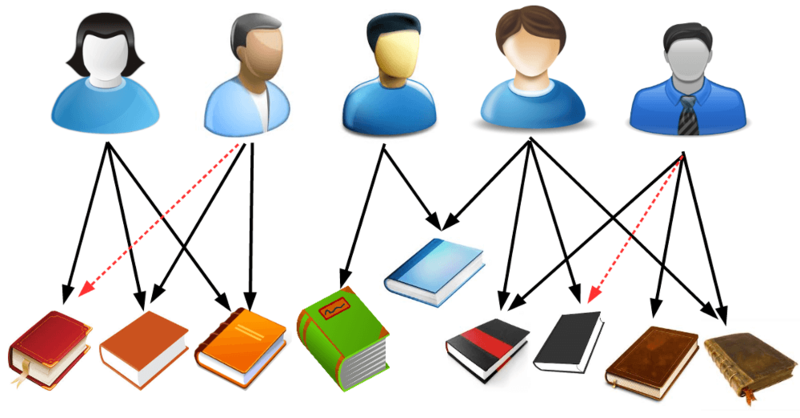 Learn how to build recommender systems from our trainer from London. Stylianos Kampakis spent over eight years at teaching, training coaching Data Science, Machine Learning and Deep Learning. Automated recommendations are everywhere – on Netflix, Youtube, Zalando app and on Amazon. Machine Learning Algorithms learn about your unique interests and show the best products or content for you as an individual. However, do you actually know how does the recommender system work? Do you know there are several ways to build a recommender system? Do you want to learn all of them? Recommender systems are complex, but it is for sure to be able to start in 1-2 days. Learn a hands-on; you’ll develop your own framework for evaluating and combining many different recommendation algorithms together, and you’ll even build your own neural networks using Tensorflow to generate recommendations from real-world cases. How To Hire Data Scientist For Your Company? What Does Data Scientist Do? A data scientist is someone who makes value out of data. Such a person proactively fetches information from various sources and analyzes it for a better understanding of how the business performs, and to build AI tools that automate certain processes within the company. There are many definitions of this job, and it is sometimes mixed with the Big Data engineer occupation. A data scientist or engineer may be X% scientist, Y% software engineer, and Z% hacker, which is why the definition of the job becomes convoluted. The actual ratios vary depending on the skills required and type of job. Usually, it’s considered normal to bring people with different sets of skills into the data science team. Data scientist duties typically include creating various machine learning-based tools or processes within the company, such as recommendation engines or automated lead scoring systems. People within this role should also be able to perform statistical analysis. In this article, we present a sample data scientist job description, for you to adjust depending on your actual needs to create a perfect job advertisement, and to find the person that will help you get the answers you are looking for. Have you ever wondered how Netflix knew to suggest that new sci-fi comedy that’s now your go-to binge watch? How does the service keep making smash-hit original shows? It’s not because its programming team is really good at throwing darts at an idea board. Netflix seems to know you because it actually does. Marketers are living in the world of big data. One of the greatest challenges they face isn’t getting information on consumers. Rather, it’s pulling something useful from those gigantic stores of data. Two methods of digging out useful insights are data mining and predictive analytics. Data mining and predictive analytics are sometimes confused with each other or rolled together, but they are two distinct specialties. As you examine the big data your company collects, it’s important you understand the differences between data mining and predictive analytics, the unique benefits of each, and how using these methods together can help you provide the products and services your customers want. Much of what you do produces data. Did you use a loyalty card last time you went grocery shopping? You can bet the grocery store was eager to collect all the information it could about this specific trip and your buying habits. Your credit card company got in on the game, too. Then, after you put the groceries away and sat down to watch your new favorite sci-fi show on Netflix, the media giant was learning about you through data points. What happens to all of this data? How do your grocery store, your credit card company, and Netflix use it to give you more personalized service? How do they use it to encourage you to buy more? Data mining plays a key role in this process. In other words, data alone is pretty useless, even if you have massive amounts of it. To make any sense of the data, you need a system of organizing it, and then searching for patterns and insights. 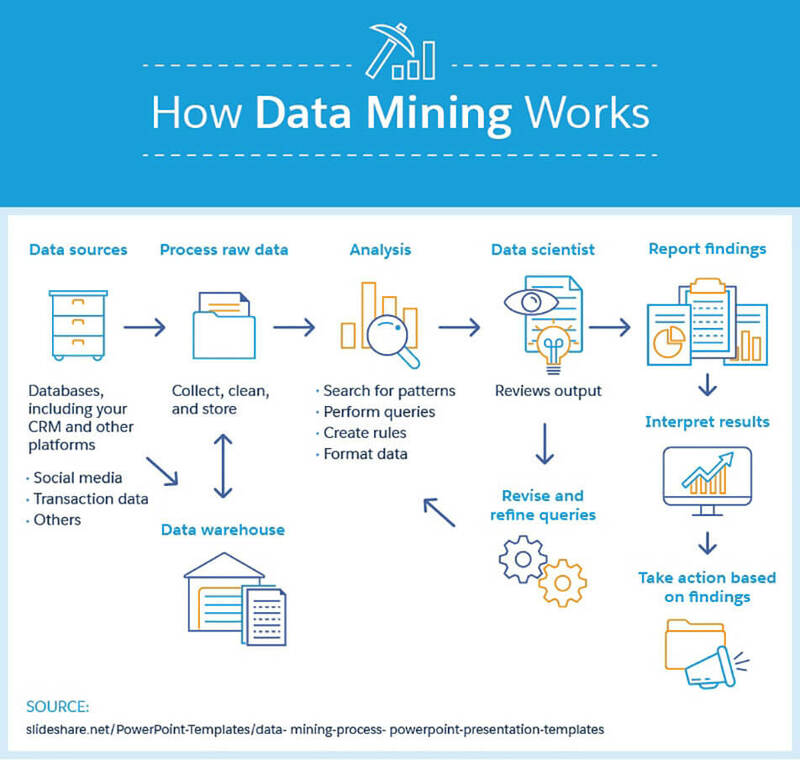 That’s exactly what data mining does, and it’s important to understand some data mining techniques and how they work. Data mining is all about organizing and interpreting data. This is only a fraction of what you can learn about a single person. Think about what you could learn from all the visitors who land on your site each day. Once you’ve captured all that information, it’s time to process and use it. Unsurprisingly, the first step in the data mining process is collecting all of that information and electronically storing it in a data warehouse. A warehouse can exist on a company’s private server or on the cloud. There’s no way you can glean useful insights from unprocessed data. Many companies choose to hire a data scientist to create organizational rules for the data warehouse. With the right organization, you can use specialized software to begin identifying patterns and trends in your data. For example, you may discover that women aged 30 to 35 from Massachusetts are more likely to buy Product B if they first purchase Product A. It stands to reason that if someone in that demographic purchases Product A, you should create an algorithm on your site that encourages them to buy Product B as well. The results of data mining are easy to predict. You save on costs, increase your ROI, and impress your happy, loyal customers. Here’s one more big benefit of data mining: It is essential for effective predictive analytics. Data mining gives you the insights, but what are you going to do with this information? In many ways, predictive analytics is the logical continuation of data mining. Predictive analytics is the means by which a data scientist uses information, which is usually garnered from data mining, to develop a predictive score for a customer or for a certain event to occur. The bank uses this information to predict whether the applicant would be a low or high risk for a mortgage. It also uses the information to determine how much money and what interest rate it is willing to offer the applicant. Of course, banks will never be able to predict with perfect accuracy who will pay their mortgage and who will not. The 2007–2008 housing crisis demonstrated the fallibility of bad predictive models. However, strong predictive analytics can certainly improve decision-making and overall accuracy. Predictive analytics works off of good, clean data. Not just anyone can dive into mined data and figure out whether a grocery store should increase its order of Pop-Tarts by 25% for the third quarter. Many large companies hire data scientists to carefully comb the data and pull out correlations and predictions. This is most often done using a method called regression analysis. Every predictive analysis is undergirded by certain assumptions, which must be monitored and updated over time as trends and opinions change. One of the reasons banks were so willing to approve mortgages so often in the early 2000s, even for applicants with low income and poor credit, was because they operated under the assumption that housing prices always go up. As soon as housing prices started to sink and overstretched customers went underwater, defaults skyrocketed. This outcome can largely be blamed on basing decisions off unsupported assumptions. 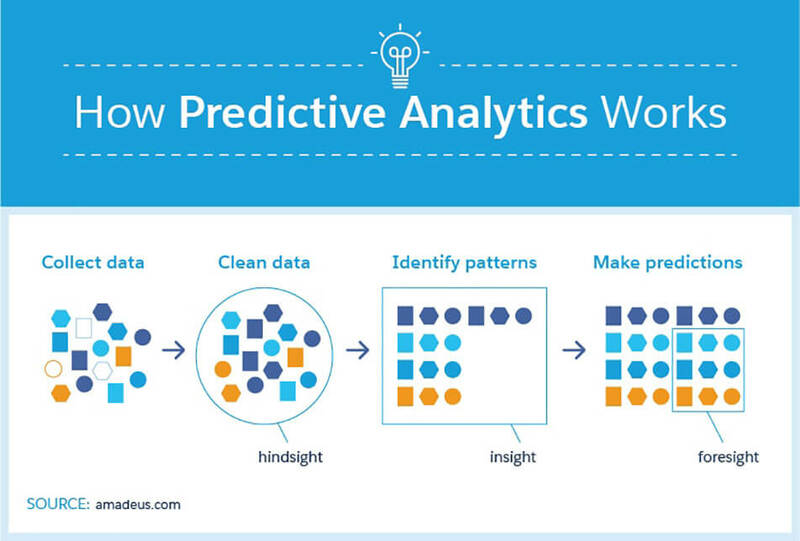 Your company benefits from predictive analytics. It’s invaluable to know what your customers are most likely to do, what they are most likely to want, and how much they’ll likely spend to get it. With the right information, predictive analytics can dramatically improve your marketing success by helping you to find the right audience at the right time in the right place with the right message. Your recent Netflix binge of that recommended sci-fi show is proof that predictive analytics works. 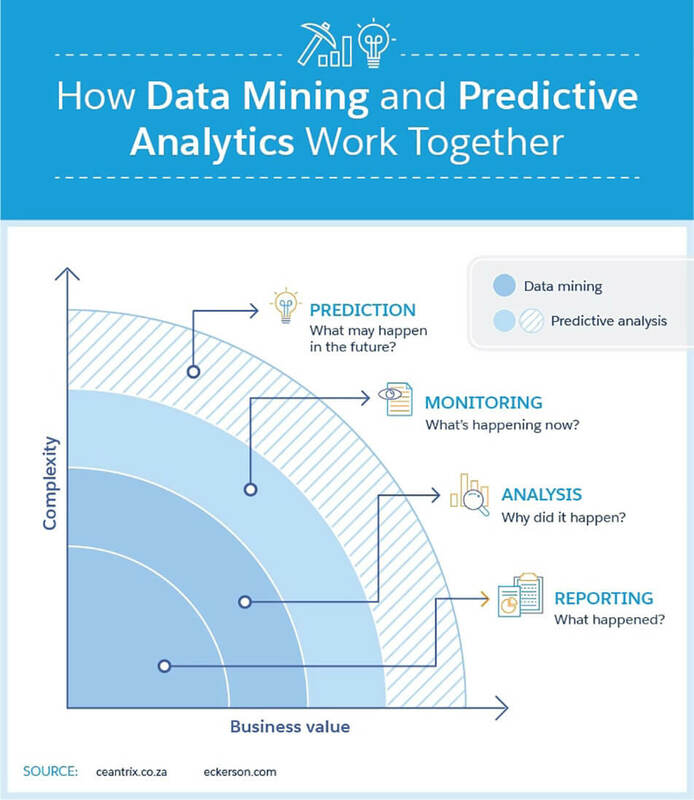 How should you use data mining and predictive analytics? Both data mining and predictive analytics deal with discovering secrets within big data, but don’t confuse these two different methodologies. The best way to understand how they differ is to remember that data mining uses software to search for patterns, while predictive analytics uses those patterns to make predictions and direct decisions. In this way, data mining often functions as a stepping stone to effective predictive analytics. While data mining is passive and provides insights, predictive analytics is active and offers clear recommendations for action. As a marketer, you need both as you navigate the world of big data. Yes, that avalanche of information can seem intimidating, but rather than running away, embrace it. Tools like data mining and predictive analytics can give you priceless insights into consumers, as well as into greater trends in your industry. With the help of data mining and predictive analytics, you can save money, increase your ROI, and potentially convince your customers you’re a bit psychic — just like Netflix. Jessica Bennett is a writer, editor, and novelist. Her clients span a number of industries, and she’s written blog posts, product descriptions, articles, white papers, and press releases— all in the name of inbound marketing. She’s proud to be Inbound Certified, but her VP of Morale, Avalon, doesn’t quite get what all the fuss is about. But he’s a rabbit, so you can’t really blame him. The original post was from Salesforce. You can find it here. Every product manager talks about data-driven product management but what is the real explanation of it? Product decisions are used to be based on product managers/owners and C-Level executives’ desires and instincts. What is the main driver of these instincts; customer feedbacks, competitive market intelligence or digital analytics results? The answer should be all of them. In this article, I will try to explain crucial data sources and which metrics should be considered in these data sources to make right product decisions. Successful products belong to customers more than product managers. But it doesn’t mean product managers should only rely on customers’ needs and demands. Sometimes even customers don’t know what they want and need. Product managers must validate their customer feedbacks with different data sources. As stated in the chart, Product Management should consider the data from Market Research, CMI (Competitor Market Intelligence), Internal Feedbacks, Digital Analytics and Customers’ Feedbacks to make data-driven decisions and create a value-added information. 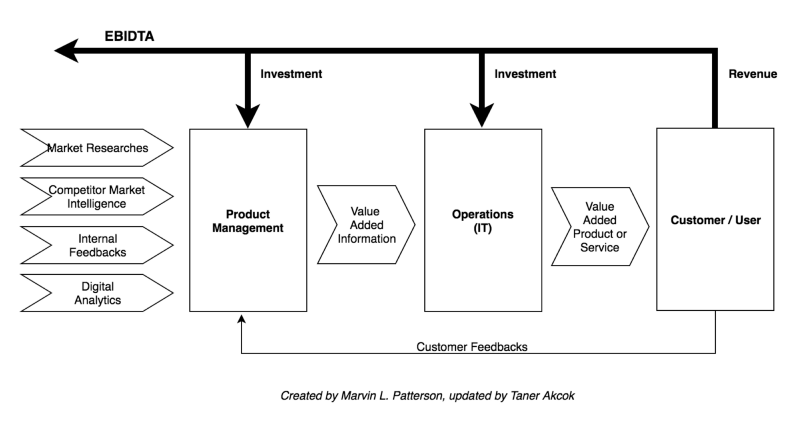 Sounds easy but assessing the value of the information and tying them to product roadmap needs an effort. Let’s deep dive into them one by one, and I will try to explain how I am using this model in my product management efforts. Check our trainer’s Taner Akcok’s article on Toward Data Science and Medium and apply our Data-Driven Product Management Bootcamp. I’m Vladislav! If you care about AI, machine learning, and data science, you should have heard of data engineering. If you haven’t, or would like to learn more – then this is *exactly* for you. Helping companies to make use of their data is a fascinating topic! I’ve spent quite a bit of time building MVP data pipelines and would like to help you avoid one of the worst mistakes you can make when starting out on a serious project. Having solid data plumbing in place is pretty darn important if you want to work with company data without wasting time and money. The natural train of thoughts when people want to make use of data “the right way”, usually ends at “we should hire a data scientist”. This one is brief but worth a read. The most important points made, is the wasted time and an observed high tendency for a data scientists who are not given the right tools to quit. A complete story of getting an analytics team up and running within 500px. Samson did a lot of stuff right, which is admirable. Take note of the tech choices, Luigi, in particular, to get data into a data warehouse. A great example of a well-thought-out way to work with data. One of the major mistakes he points out: not putting enough effort into data evangelism. An utterly amazing interview, full of great advice. I especially love that he points out that you should take care of making both event and operational transaction data available. Only if you combine them, you have a complete picture. A very long interview with the Head of BI at Stylight. Konstantin did an impressive job in his first year and shares a lot of insight. This is not exactly about data engineering but on the topic of giving a company access to data and how to approach it. One of the most important takeaways for me was his advice to secure a small win for as many people as possible in the company when starting out. There are a lot of low-hanging fruits and you get the best ROI and a lot of goodwill from making them available. Hope you’ll get a lot of value from those articles! If you want to learn more about data engineering, data pipelines and the stuff I do, scroll to the bottom of the last article and subscribe to Beyond Machine and Vladislav‘s mailing list. Beyond Machine (rebranded from M.I.E) was spawned from Lele and Irene constant frustration during the founding of their AI startups. In the end of 2015, they both left their jobs at rising mobile ad tech and product companies. Lele first started SoCrowd and pivoted to Deckard after 3 months. Irene wanted to tackle the challenges of visual recognition. It quickly became apparent that there was a need for a more developed community an outlet for media around Machine Intelligence. After running a fruitful and inspiring Evening Summit, they decided to take Beyond Machine. to the next level, founding a media company.focus on the training, re-education, and networking in the field of AI and innovative technology. Irene decided to leave FindEssence, the first company she co-founded and push forward the growth of Beyond Machine. Beyond Machine’s mission: To connect people in AI industry globally, bringing profound and engaging content and to start a conversation about job substitution issues. M.I.E. Summit Berlin 2017 is the World’s first open-space machine intelligence summit, which will be held on the 20th of June 2017. This event will give you the opportunity to learn, discuss and network with your peers in the MI field. Backdropped in one of Berlin’s most vibrant and artistic locations, break free from traditional conference rooms and share a drink in a typical Berliner Biergarten. The M.I.E Summit Berlin 2017 will provide you with two in-depth event tracks (keynotes, workshops, and panels) as well as over 25 leading speakers and unparalleled networking opportunities. MIE (rebranded to Beyond Machine) was spawned from Lele and Irene frustration during the founding of their AI startups. It quickly became apparent that there was a need for a more developed community an outlet for media around Machine Intelligence. After running a fruitful and inspiring Summit, they decided to found a media company focus on education, training, networking in AI and innovative technology.